According to countless movies and TV shows, sea captains, in addition to getting to wear dapper uniforms and snazzy hats, have the ability to marry couples aboard their ships thanks to the power bestowed upon them by… the sea we guess? So can these captains actually perform marriages that are then legally binding? As in most things in life, particularly when the law is involved, it’s complicated. However, as a general rule, with a few exceptions like Japan, Bermuda, and Romania, sea captains do not have any inherent authority to officiate weddings where the couple will then be considered legally married. Despite this sort of authority not really being a thing in most regions, it is entirely possible, and not even terribly uncommon, for sea captains to marry couples. For example, one Captain Arnold Wonsever, working for Skyline Cruises in New York, noted he performs on average close to 200 weddings per year. So how do all those sea captains who currently do it get around the legality problem, and where did the ubiquitous idea that such individuals had that authority come from in the first place? To begin with, because there is such a common notion worldwide that sea captains are able to officiate legally binding marriages, some sea captains choose to go get the extra certification they’d need to do so. It’s simply a great way to make a little side money while otherwise performing their day job of captaining the ship. It’s also in some cases a way to get more people to come aboard your ship in the form of wedding parties. Getting such certification isn’t difficult in many regions, such as in the United States where becoming ordained is absurdly easy, with various organizations offering this service online, in a few cases even for free. 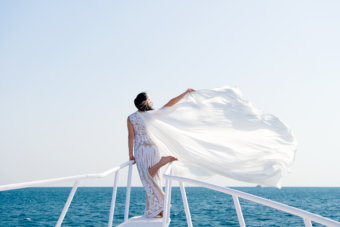 Moving beyond the certified, some sea captains will simply officiate a wedding ceremony, but with it understood that said individual does not have the ability to sign off on things to make the marriage legally binding. However, there is even a caveat here in that, depending on where you’re from, it may be the case that declaring in front of witnesses that you’re marrying someone that you also then go and live with can qualify you for a common law marriage. And, contrary to popular belief, it’s often not required that you live with the person for several years before said common law marriage kicks in. In some places, it’s instant. In this case, it wouldn’t matter if you had the guy who swabs the decks, or even a literal bilge rat, perform the ceremony. It could still be legally binding if you wanted it to be. And, pro-tip- the bilge rat’s probably way cheaper than getting the captain to do it. For all other cases where the captain has no legal authority here, the individuals getting married will typically just go get married officially in front of a judge or minister somewhere else either before or after their wedding at sea. In fact, aboard some cruise ships where the sea captain isn’t certified to officially marry a couple, but said company offers some sort of wedding service package, the company will simply have an individual on board who does have the required certification. This way the couple gets the sea captain wedding ceremony they wanted, and the legally binding side of things as well all in one place. This all brings us around to the question of how this widely accepted trope came about. Well, nobody knows for sure… But the general thought is that, as traveling across the big blue was once a rather time consuming process and potentially done with many people packed aboard off to start new lives, there was sometimes desire for marriage while on the trip. Now with the occasional need established, it’s also noteworthy that sea captains once had near absolute authority over the vessels they commanded. For example, captains from many regions historically had the authority to do things like arrest and jail those aboard their ships, create birth and death certificates, more or less function as a notary for official documents like wills, and even in some cases were required to note in their logs when weddings occurred aboard their ship. Thus, it’s hypothesized that these types of extra powers, particularly officially logging marriages that happen on the ship and then later reporting them to authorities, all perhaps gave the general public the idea that captains could legally marry couples. And, for whatever reason, sea captains seem to have been happy to oblige such requests. The commanding officer shall not perform a marriage ceremony on board his ship or aircraft. He shall not permit a marriage ceremony to be performed on board when the ship or aircraft is outside the territory of the United States. According to the regulations, the only time such marriages are allowed is if a registered official who can perform a legally binding marriage is aboard the ship or plane and all relevant permits and permissions in accordance with local laws of the couple being married have been obtained. Outside of that, however, the first sentence forbids captains from performing the ceremony, and the second sentence forbids them from allowing others to do it when at sea, presumably owing to the legal complication that arises from marrying people when out in international waters. But to sum all this up- no, as a general rule, outside of the caveats previously mentioned, sea captains do not have the authority to legally marry a couple. This, however, has not stopped them from performing such ceremonies, nor Hollywood from promoting the idea that they do have this power. This has all resulted in an almost world-wide notion today that sea captains are able to do this, in turn resulting in some captains getting additional certification to be able to marry couples looking for a sea based wedding performed by someone in a snazzy uniform. The culmination of all of this has even resulted in places like Japan and Romania granting their sea captains this ability. And in recent years there’s even been a push by shipping unions in the UK to likewise give sea captains this ability without having to jump through an extra hoop of getting outside certification. Can Boat Captains Really Marry People? Are Ship Captains Allowed to Marry People at Sea?